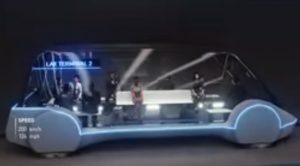 On Thursday, Elon Musk Tweeted that first test tunnel from Boring Company for its top-speed transit system will be ready for public experience on December 18. The launching of this project was planned a week before the final announcement. The CEO of the company said that it will also disclose Fully Legal Autonomous Transport Cars, thought to be the pods for carrying passengers through the tunnels. He added that the company will also have an option to check out the special elevators of the system. These elevators are designed to take regular vehicles and the passenger pods between the street and the transportation tunnel. It is expected that a day after the launch event, members of the public will be offered free rides through the tunnel. Running for about 3 miles, the test tunnel is being constructed in Hawthorne, California. The place is the home of another of Musk’s business ventures, SpaceX. The website of the Boring Company has indicated that the tunnel travels a short distance north from below SpaceX’s headquarters before turning and traveling west for several miles. The December announcement would present a massive chance for Elon Musk and the Boring Company to give the project global publicity and show off the potential of the system. The dedication of Musk isn’t just to revolutionize the tunneling industry with faster and more efficient boring machines, but also to use them to build networks of tunnels aimed at easing congestion on busy city streets. Passengers, cyclists, and even Cars will be transported on electric-powered sleds at speeds of more than 150 mph to multiple destinations across the city. Vehicles and passenger pods would be lowered onto the sleds from street level via an elevator system. The elevators could also connect to office buildings or even private residences.